Peel and cut cucumbers in thin slices. 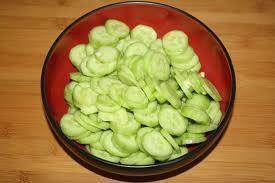 Place cucumbers in a bowl. Mix all remaining ingredients. Add ingredients to cucumbers. Chill for one hour or overnight.